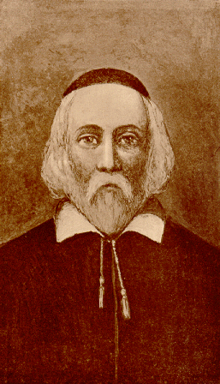 William Brewster (1566 – 10 April 1644) was an English official and Mayflower passenger in 1620. In Plymouth Colony, by virtue of his education and existing stature with those immigrating from the Netherlands, Brewster, a separatist, became senior elder and the leader of the community. William Brewster was born in 1568, most probably in Scrooby, Nottinghamshire, England. He was the son of William Brewster and he had a number of half-siblings. His paternal grandparents were William Brewster (1510–1558), and Maud Mann (1513–1558) from Scotland. A first-person historical interpreter portraying Elder William Brewster at Plimoth Plantation. Restrictions and pressures applied by the authorities convinced the congregation of a need to immigrate to the more sympathetic atmosphere of Holland, but leaving England without permission was illegal at the time, so that departure was a complex matter. On its first attempt, in 1607, the group was arrested at Scotia Creek, but in 1608, Brewster and others were successful in leaving from The Humber. In 1609, he was selected as ruling elder of the congregation. William lived near St. Peter's church (Dutch: Pieterskerk) in Leiden with his wife and children. He taught English to Leiden University students and was also a printer of religious pamphlets. His son, Jonathan, was a ribbonweaver. William was chosen as assistant and later as an elder to Pastor John Robinson. He was still an elder when he travelled to Plymouth Colony in 1620. In Leiden, the group managed to make a living. 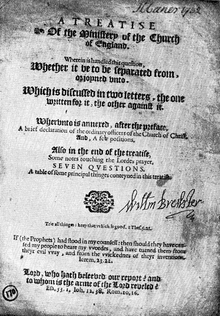 Brewster taught English and later, in 1616–1619, as the partner of one Thomas Brewer, printed and published religious books for sale in England, though they were proscribed there. In 1619 Brewster and Edward Winslow published a religious tract, Perth Assembly, critical of the English king and his bishops. James ordered Brewster's arrest, and when the king's agents in Holland came to seize the Pilgrim elder, Brewster was forced into hiding just as preparations to depart for America entered the most critical phase. The printing type was seized by the authorities from the English ambassador, Sir Dudley Carleton, and Brewster's partner was arrested. Brewster escaped and, with the help of Robert Cushman and Sir Edwin Sandys, obtained a land patent from the London Virginia Company on behalf of himself and his colleagues. With Brewster in hiding, the Separatists looked to their deacon John Carver and to Robert Cushman to carry on negotiations with the appropriate officials in London. In 1620 when it came time for the Mayflower departure, Elder Brewster returned to the Leiden congregation. He had been hiding out in Holland and perhaps even England for the last year. At the time of his return, Brewster was the highest-ranking layperson of the congregation and would be their designated spiritual leader in the New World. Brewster joined the first group of Separatists aboard the Mayflower on the voyage to North America. Brewster was accompanied by his wife, Mary Brewster, and his sons: Love Brewster and Wrestling Brewster. Among the people boarding the Mayflower were four unaccompanied children from Shipton, Shropshire. They were placed as indentured servants with senior Separatists William Brewster, John Carver and Robert Cushman, on behalf of Samuel More, husband of the children's mother, Katherine More. The children were placed without their mother's permission after four rancorous years between the Mores over charges of adultery against Katherine and her longtime lover, the children's alleged father. Two children were placed with William and Mary Brewster. The Mayflower departed Plymouth in England in September 1620. The 100-foot vessel carried 102 passengers and a crew of 30 to 40 in extremely cramped conditions. During the voyage, the ship was buffeted by strong westerly gales. The caulking of its planks was failing to keep out sea water, and the passengers' berths were not always dry. On the journey there were two deaths, a crew member and a passenger. After being blown off course by gales, the Mayflower made a landing at Cape Cod. Finding the area near Provincetown occupied by indigenous people, the ship's company decided to continue exploring along the nearby coast. The group arrived in the area near present-day Plymouth, Massachusetts on December 21, 1620. In the space of several months almost half the passengers perished in the cold, harsh New England winter. 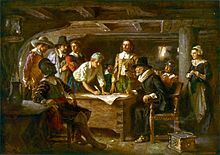 When the passengers of the Mayflower landed at Plymouth Colony, Brewster became the senior elder, and so served as the religious leader of the colony; in the colony, he became a separatist leader and preacher, and eventually,[when?] as an adviser to Governor William Bradford. Brewster's son Jonathan joined the family in November 1621, arriving at Plymouth on the ship Fortune, and daughters Patience and Fear arrived in July 1623 aboard the Anne. Brewster Gardens, Plymouth, Massachusetts. The park covers the original garden plot that was granted to William Brewster in 1620. As the only university educated member of the colony, Brewster took the part of the colony's religious leader until a pastor, Ralph Smith, arrived in 1629. Thereafter, he continued to preach irregularly until his death in April 1644. "He was tenderhearted and compassionate of such as were in misery," Bradford wrote, "but especially of such as had been of good estate and rank and fallen unto want and poverty." Brewster was granted land amongst the islands of Boston Harbor, and four of the outer islands (Great Brewster, Little Brewster, Middle Brewster and Outer Brewster) now bear his name. In 1632, Brewster received lands in nearby Duxbury and removed from Plymouth to create a farm there. In 1634, smallpox and influenza ravaged both the English and the Indians in the region. William Brewster, whose family had managed to survive the first terrible winter unscathed, lost two daughters, Fear and Patience, now married to Isaac Allerton and Thomas Prence, respectively. In 1591 or 1592, William Brewster married a woman named Mary, whose surname is unknown; no formal record of their marriage appears in the preserved marriage records of Nottinghamshire Archives. The search for further information on Mary—about whom many theories, e.g., about surname, have been offered—as well as on the marriage, has been extensive, e.g., by Jeremy Bangs, Director of the American Pilgrim Museum in Leiden, Holland. Jonathan Brewster (12 August 1593 – 7 August 1659) married Lucretia Oldham of Derby on 10 April 1624, and were the parents of eight children. He was the father of Mary Turner and the grandfather of Amos Turner. Patience Brewster (c. 1600 – 12 December 1634) married Gov. Thomas Prence of Lechlade, Gloucestershire, 4 children. Fear Brewster (c. 1606 – before 1634) so called because she was born at the height of the Puritans' persecution. Married Isaac Allerton of London, 2 children. Unnamed child was born, died and buried in 1609 in Leiden, Holland. Love Brewster was born in Leiden, Holland, about 1611 and died between 6 October 1650 and 31 January 1650/1, at Duxbury, in Plymouth Colony. At the age of about 9, he travelled with his father, mother and brother, Wrestling, on the Mayflower to Plymouth Colony. There he married Sarah Collier on 15 May 1634. Love and Sarah were the parents of four children. Mary More, age 4, assigned as a servant of William Brewster. She died sometime in the winter of 1620/1621. Her burial place is unknown, but may have been on Cole's Hill in Plymouth in an unmarked grave, as with so many others buried there that winter. As with her sister Ellen, she is recognized on the Pilgrim Memorial Tomb in Plymouth, misidentified after her sister's name as "and a brother (children)," the mistake of calling her "a brother" arising from William Bradford's failing memory years after the event of her death. Richard More, age 6, servant of William Brewster. He resided with the Brewster family until about mid-1627 when his term of indentureship expired. His name appears, at age 14, in a census as a member of the Brewster family, in what was called then "New Plimouth". By 1628, Richard was in the employ of Pilgrim Isaac Allerton, who was engaged in trans-Atlantic trading. William Brewster died on 18 April 1644, at Duxbury, Plymouth Colony. He was predeceased by his wife, Mary Brewster, who died in April 1627, age about sixty. [self-published source] Brewster's body was buried at Burial Hill in Plymouth. A memorial stone exists there for him, which states that it is in honour of "Elder William Brewster, Patriarch of the Pilgrims and their Ruling Elder 1609–1644". The burial place of his wife Mary is unknown. James Brewster, coachbuilder, immortalized in Cole Porter's song "You're the Top"
^ a b Stratton, Eugene Aubrey (1986). Plymouth Colony: Its History and People, 1620–1691, p. 251, Salt Lake City, UT, US: Ancestry Publishing. ^ a b Merrick, Barbara Lambert [Ed., Comp.] (2000). William Brewster of the Mayflower and His Descendants for Four Generations, 3rd Rev. Edn., pp. 1–5, 30-35, Plymouth, MA, US: General Society of Mayflower Descendants. ^ "Brewster, William (BRWR580W)". A Cambridge Alumni Database. University of Cambridge. ^ a b c d Philbrick, pp. 16-18. ^ Philbrick, pp. 13 and 16–17. ^ Wallace Nutting (1921). Furniture of the Pilgrim century: 1620–1720, including colonial utensils and hardware. Marshall Jones Company. p. 182. ^ Donald F. Harris, PhD., the Mayflower Descendant (July 1994) vol. 44 no. 2 pp. 112–114. ^ Steele, Ashbel (1857). Chief of the Pilgrims: Or, The Life and Time of William Brewster, Ruling Elder of the Pilgrim Company That Founded New Plymouth, the Parent Colony of New England, in 1620, p. 353, Philadelphia, PA, US: J.B. Lippincott. ^ a b Bangs, Jeremy Dupertius (2012). The Mayflower Quarterly, vol. 78, no. 2 (June), p. 145. ^ Harris, Donald F. (1994). "The More Children of the Mayflower, Part III," The Mayflower Descendant, Vol. 44, no. 2 (July), p. 4. ^ Philbrick, p. 26, 76. ^ Mayflower Families Volume 15 Family of Richard More (Published by General Society of Mayflower Descendants 1997), p. 151, Plymouth, MA, US: General Society of Mayflower Descendants. ^ Bradford, William. Of Plymouth Colony: 1608-1650. ^ Cottrell, Robert C. (2010). "Roger Baldwin: Founder, American Civil Liberties Union, 1884–1981". Harvard Square Library. pp. 1–12. ISBN 9780231119726. Archived from the original on 27 July 2010. Retrieved 18 July 2010. ^ a b c d e f g Roberts, Gary Boyd (1983). Genealogies of Connecticut Families: From the New England Historical and Genealogical Register, p. 649, 668, Baltimore, MD, US: Genealogical Publishing, ISBN 9780806310305. ^ Johnson, Caleb (2007). "Famous Descendants of Mayflower Passengers – Mayflower Ancestry of Lindy Boggs". Archived from the original on 16 December 2009. Retrieved 10 March 2010. ^ Wright, R.W. (1878). Biographical Record: Yale University, Class of 1842, New Haven, CT, US: Tuttle, Morehouse & Taylor. ^ "Jordana Brewster profile". E! Online. Archived from the original on 10 February 2007. Retrieved 26 April 2007. ^ Obituary: "Kingman Brewster, Jr." New York Times. 9 November 1988. ^ Fitch, Noel Riley (1999). Appetite for Life: The Biography of Julia Child, p. 10, New York, NY, US: Doubleday. ^ a b Giddins, Gary (2002). Bing Crosby: A Pocketful of Dreams, The Early Years 1903–1940. Back Bay Books. p. 24. ISBN 9780316886451. ^ Edith L. Blumhofer, Her Heart Can See: The life and Hymns of Fanny J. Crosby (William B. Eerdmans Publishing Co., 2005):11. ^ Reitwiesner, William Addams (2007). "Ancestry of Ted Danson". ^ a b Reitwiesner, William Addams (2007). "Ancestry of George W. Bush". Retrieved 10 March 2010. ^ Roberts, Gary Boyd (n.d.). "The New England Ancestry of Actor Richard (Tiffany) Gere". New England Historic Genealogical Society. Retrieved 10 March 2010. ^ Gipson, Lawrence Henry (1969). "An Appreciation," in Gaetano L. Vincitorio et al. (eds. ), Crisis in the "Great republic": Essays Presented to Ross J.S. Hoffman, p. xiv, LOCATION: Fordham University Press. ^ Newport Historical Society (1913). Items of interest concerning Oliver Hazard Perry in Newport, and Newport in the War of 1812, p. 24, Newport, RI, US: Newport Historical Society. ^ Roberts, Gary Boyd (2000). "The Ancestry of Novelist Thomas Pynchon". Archived from the original on 22 June 2010. Retrieved 13 April 2010. ^ Johnson, Caleb (2007). "Famous Descendants of Mayflower Passengers – Mayflower Ancestry of Cokie Roberts". Archived from the original on 16 December 2009. Retrieved 10 March 2010. ^ Yarbrough, Tinsley E. (2005). David Hackett Souter:Traditional Republican on the Rehnquist Court. Oxford, Oxon, ENG: Oxford University Press. p. 3. ISBN 9780195159332. ^ Roberts, Gary Boyd (n.d.). "The New England Ancestry of Arthur Ochs Sulzberger, Jr". New England Historic Genealogical Society. Retrieved 10 March 2010. ^ Johnson, Caleb (2007). "Famous Descendants of Mayflower Passengers – Mayflower Ancestry of Zachary Taylor". Archived from the original on 16 December 2009. Retrieved 10 March 2010. ^ Roberts, Gary Boyd (n.d.). "The New England Ancestry of Sewall Green Wright". New England Historic Genealogical Society. Retrieved 10 March 2010. This article incorporates text from a publication now in the public domain: Chisholm, Hugh, ed. (1911). "Brewster, William" . Encyclopædia Britannica (11th ed.). Cambridge University Press. Jones, Emma C. Brewster (1908). The Brewster Genealogy, 1566–1907: A Record of the Descendants of William Brewster of the "Mayflower," Ruling Elder of the Pilgrim Church Which Founded Plymouth Colony in 1620, New York, NY, US: Grafton Press. Wilson, J. G.; Fiske, J., eds. (1900). "Brewster, William (pilgrim)" . Appletons' Cyclopædia of American Biography. New York: D. Appleton. Time Inc (29 November 1948). LIFE. Time Inc. p. 129. 'Brewster, William' in the American National Biography (2000) and the Oxford Dictionary of National Biography (2004). Merrick, Barbara Lambert, ed. (2003). William Brewster of the Mayflower and the Fifth Generation Descendants of His Son Love. Mayflower families in progress. Plymouth, MA, US: General Society of Mayflower Descendants. Dowsing, J. Places of the Pilgrim Fathers Sunrise Press, London. David Beale, "The Mayflower Pilgrims: Roots of the Puritan, Presbyterian, Congregationalist, and Baptist Heritage" (Greenville, SC: Emerald House Group and BJU Press, 2000). Schmidt, Gary D. (1 June 2004). A Passionate Usefulness: The Life and Literary Labors of Hannah Adams. ISBN 9780813922720. William Bradford (1856). History of Plymouth Plantation. Little Brown. This page was last edited on 15 April 2019, at 16:44 (UTC).